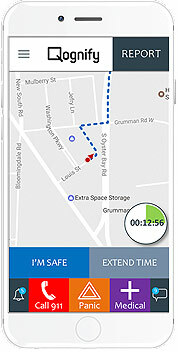 Using integrated technology to geometrically improve personal safety. Entec Solutions is an authorized vendor for Qognify's line of sophisticated applications, including SEEitSENDit and GaurdMe, both part of its Extend product family. The SEEitSENDit app enables faculty and staff to communicate and report through their mobile phone. This includes incidents, risks and suspects, and to provide textual, visual and geographic information instantly. 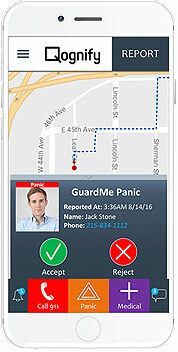 GuardMe allows personal notification in situations of distress with realtime geolocation and progress monitoring. Qognify's Extend harnesses a unique combination of advanced technology, which is at everyone’s reach, and the ability to apply human logic and analysis to bring this information, in the right time and context, into the organization's control. See how Qognify's amazing integration ties many disparate systems together, giving you the power to tap into a huge wealth of incoming information - making everyone safer. Today, almost everybody carries a smart mobile phone capable of sending messages and capturing exactly what is happening through images and video, all with an accurate location. What makes these devices into a smart sensor is not just the technology, but the fact that human consideration and processing is in the loop. When there is need to report on an issue, an emergency, or other critical event, personal safety apps like SEEitSENDit dramatically increase communication and quickly connect those who need to know and who can respond. Administrators, medical, & security personnel are in the loop immediately & authorities can be notified much more quickly. Communication is superior & time is saved when it's most critical. From events that potentially affect many people to single personal distress, the quality of safety operations & the overall environment are improved far beyond what traditional methods could ever offer. 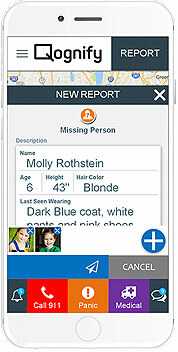 SeeItSendIt – enables your staff, in any location, to communicate and report through their mobile phone, on incidents, risks and suspects, and provide textual, visual and geographic information instantly. 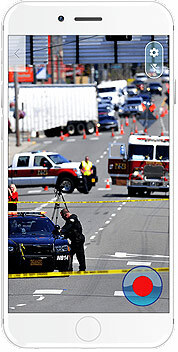 Live Video Broadcasting - allows field personnel to broadcast live video directly to the control room. Increasing your surveillance coverage by making every mobile phone into a potential surveillance camera. GuardMe - provides users with a simple personal security services, monitoring their progress from point A to point B and enabling immediate report of distress situations. Dispatch - the application enables effective communication and management of field personnel by providing operators with simple Computer Aided Dispatch (CAD) functionalities. We'd be glad to discuss how the apps in the Extend family could help your school or organization.